The Garter Snake is probably one of the most popular snakes for the beginner. Garter Snakes are small, attractive and inexpensive. A very docile even-tempered snake that is quite tolerant of frequent handling. The Garter Snake is very hardy, easy to feed, easy to maintain, and will live up to about 12 years. 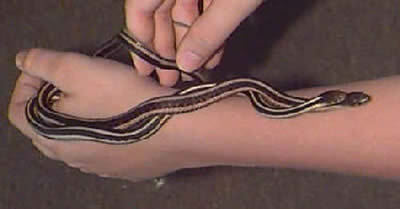 Description: The Garter Snake will grow up to four feet (60cm). They are slender bodied with a narrow head. Their natural color is brown to olive brown with three yellowish stripes running down the back, and there are squarish blotches running down the body between the stripes. The scales are heavily keeled. Feeding: Their diet consists of small fish, earthworms, insects and frogs. Feed every few days as they don't eat much at once and are very active. Fresh water in a shallow dish should always be available. You can set up their terrarium as either a woodland terrarium or an aqua terrarium. Although they need high humidity and are often aquatic, you must keep the basking side of their terrarium very dry to avoid skin infections, especially boils. See the terrarium types described under Basic Reptile and Amphibian Care for more information. The Garter Snake needs a hiding place, a small water dish, and they like to climb, so a vertical or semi-vertical tree limb with some plant vining is great. Temperature and Lighting requirements: They are a cool temperature snake, so do well at 68 - 74° F (20 - 25° C) in the daytime. Full spectrum lighting is important for your snakes well being and its long-term maintenance. You can use a a low wattage full spectrum incandescent daytime bulb and a blacklight bulb or red incandescent bulb for nighttime heating if necessary. Be sure you use a thermometer so you don't let the terrarium become overheated! Distribution: Garter Snakes range from Canada in the north and south through the United States, Central America and extreme northern South America. Garter snakes are found in Alaska and are found farther north than probably any snake species in the world. Breeding/Reproduction: These snakes become sexually mature at three years. They are livebearers and have about 24 babies. They breed readily in captivity. Availability: The Garter Snake is very common, readily available, and very inexpensive. Hey, cought another garter snake and I believe it is male. He is about 2 feet long and laughs at me so I will name him giggles. I saved him from a HUGE 7 FOOT LONG WATER MOCASIN (which attempted to kill me). I was wondering what should I do to keep him alive as he is much smaller (in being wide) and has a small head. Also I would like to breed them and was thinking that I could attempt to mimic their habitat by using different soils and maybe some plants along with a filtered pool(about 5 gallons or less) with live fish and plants and frogs. My mom asked me if it was a boy or a girl and I had to say it was a girl or she would get mad about baby snakes living in the house. All I want to do is replenish the wild numbers. I also need name suggestions for the one that really is a girl. To start, becareful around water mocasins. Dangerous snake to tangle with. your snake should be fine as long as the large one is well fed. Take caution feeding them together, that is when on occasion accidents happen. Water Moccasins don't eat other snakes they eat fish, small game, and things like that but never a snake from what I know. Are you sure the snake you saw trying to eat it wasn't a king snake which regulary prey upon other snakes? It was a moccasin cause I saw the inside of its mouth. Yeah, fond memories of these snakes, i started out with them. Of course i get wild ones, don't see why i should pay for one when they are in my backyard. I did get bitten a couple of times while taming them, although i've only gotten bitten about once or twice. They are an extremely docile snakes for being wild. I tamed a common garter that i caught at it's full size. My big brother found a little baby butlers garter snake that was only about 10 inches long if that, and it grew to a big snake almost six feet long. My memory may be exaggeratig a bit, but it was at least 5 feet long. That's amazing so would you recommend a garter snake to a beginner? Hi again, that ribbon snake i found turned out to be a girl and she had babies,roughly 10, and i think you dont feed them the first 2 days and then you start them on cut up night crawlers the you go to full or half crawlers then to fish then to frogs or mice, is this correct and how can i get them to eat mice? It will be some time before they can safely consume mice. Crickets, worms and even some guppies in the water will do they well for quite awhile. Hi, i counted up the baby snakes, 15 total, and i was wondering if fish would be safe for them as they wont eat crikets. also, i was wondering if a large water bowl would be okay for them, please reply a.s.a.p. That should be fine. I have always kept seperate bowl with little guppies in it for the snakes to hunt.